My XPS 13 wakes up from suspend by itself. This is very annoying and potentially dangerous since it happens while the computer is its sleeve/bag. Can't tell from the pm-suspend and dmesg what causes the behavior so please let me know what logs you need to investigate it and I will provide them. Further note: It seems like the spontaneous wake up is happening around 40 minutes after suspend every time it occurs. However, the spontaneous wake up does not occur every time. Can you copy the current BIOS settings and disk layout to this bug report? Yes, of course. In what format do you want them? A picture of the BIOS settings would be fine. For the disk layout, "sudo parted /dev/sda print" would be ideal. Also, I noticed that you're running in EFI mode, which isn't what is used or tested for factory installs. I think I need to run in EFI mode to be able to dual boot W8 and Linux successfully, right? Just out of curiosity. How could EFI and/or disk partioning trigger a wake up? Attached pictures of BIOS settings and parted printout. Thanks. Can you try disabling Smart Connect in the BIOS and see if the problem persists? Note that this will also disable Smart Connect for Windows, which I assume that you have installed based on your partition table. I will try that. I don't use W8 actively (need it for some banking) so if I lose a feature or two in W8 does not matter to me. Will try your fix and get back in a day or two when I have done some test runs. Think it happened again, even though Smart-Connect is disabled. When I came home and took out my laptop from its sleeve it was running even though it was suspended when I put it in the sleeve. However, it did not happen earlier during the day. Tue Apr 9 16:56:35 CEST 2013: Awake. I am using lid-sensing suspend but I doubt that the laptop lid opened while in the sleeve. Maybe the sensor is to sensitive? I've had this issue too. Disabling Smart-connect did not help. Has occurred even when the laptop was just sitting on the table, in suspend, with the lid closed. I have the same problem on an HP EliteBook Folio 9470m. I've had this issue too. Disabling Intel SmartConnect did not help. I'm using Linux "3.8.0-17-generic #27-Ubuntu SMP" beacuse the 3.8.0-19-generic is failing to adjust the screen brightness. I'm experiencing this as well. One time I opened the lid after the system had woken up and immediately closed it again and the system didn't suspend any more. Even worse: I couldn't power it down. At all. I held the power button for 30 seconds yet nothing happened. I had to unplug the power cord and let it sit there during the night until the battery was empty. The next day I was able to start it again. Thu Jun 20 11:00:18 PDT 2013: Awake. Jun 20 08:59:47 sputacchio kernel: [28423.045743] psmouse serio1: Trackpad at is a0060/serio1/input0 - driver resynced. Notice that the first message at resume is acpid: client 1669[0:0] has disconnected. I never touched the BIOS, it's the stock configuration stuff (smart connect and rapid start are enabled). What are the disadvantages for Ubuntu if I disable them? Wed Jun 26 01:53:10 CEST 2013: Awake. Strangely there is no sign of activity on syslog around that time, so I'm assuming whatever wakes the system up is not the kernel. Any other clues on things to disable? - The full output of running "sudo parted /dev/sda print" from the commandline. 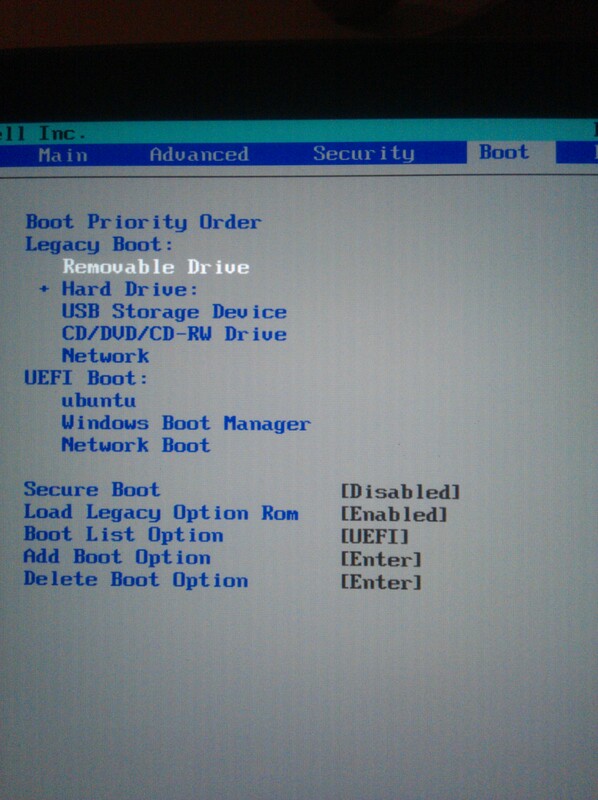 - Whether the boot mode is UEFI or BIOS. - Under the "Advanced" tab in the BIOS setup, whether "Intel (R) Smart Connect Technology" is enabled. - Under the "Advanced" tab in the BIOS setup, whether "Intel (R) Rapid Start Technology" is enabled. 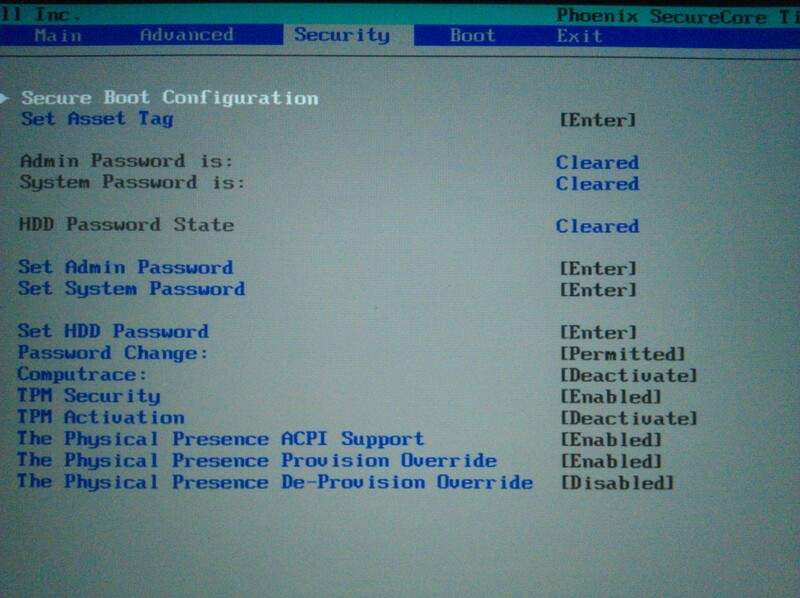 - Under the "Security" tab in the BIOS setup, whether "TPM Security" is enabled. - Under the "Security" tab in the BIOS setup, the value of "TPM Activation"
- Under the "Security" tab in the BIOS setup, whether "The Physical Presence ACPI Support" is enabled. "Intel (R) Smart Connect Technology" is disabled. "Intel (R) Rapid Start Technology" is enabled. "The Physical Presence ACPI Support" is enabled. Thanks, Fabio. How did you configure sda6? Can you also give the output of "cat /proc/swaps" as well as "mount"? Assuming you have not manually configured your system to use the TPM, can you disable "TPM Security" in the BIOS setup and let me know if the problem persists? "Intel Rapid Start" and "Intel Smart Connect" had been disabled as these options were draining the battery. I enabled "Rapid Start" yesterday for tests purpose, but since then, the laptop didn't wake up. I will monitor the system and do tests with "TPM Security". I will answer you as soon as I get results. FYI. Just after answer, I closed the lid but the system had not suspended. Some minutes later, I reopened it but there is no response. Since power button also don't work, there is no solution except wait for battery discharging. Have you tried holding down the battery to power it down? Did this start happening after enabling Rapid Start while keeping the TPM and Smart Connect both disabled? In my tests, having Rapid Start enabled but Smart Connect disabled and the TPM fully disabled result in Rapid Start functionality working properly with Ubuntu on all versions of the XPS 13 (L321X and both the HD and FHD versions of L322X). For the L322X, there is no option in the firmware setup to set the Rapid Start timer, but the default I found was 30 minutes. Do you mean holding down the power button? Yes. No effect. The system freezes with black video and keyboard ligths on. This start happening after enabling Rapid Start while Smart Connect disabled and TPM ENABLED as I want to confirm that the problem still occurs and make sure that the solution solves it, avoiding a false positive test. The freeze is just another effect of this issue. Sorry, yes, I meant the pressing the power button, which should turn it off. Please do tell me if disabling "TPM Security" in the firmware setup makes a difference. Then we can debug further. Thank you for your patience. I am actually trying to reproduce the bug on an L322X (HD version) and can't this time around. I'll need to do some more testing. After I turned off borth Smart Connect and Rapid Start I have not, yet, experienced any random wake ups from suspend. However, I do see some messages about TPM (something "-1") when I wake up my computer. The message flashes quickly (on the same tty as X is running) before it is replaced by X. Maybe someone knows how to retrieve it? 2. Verify that the problem does actually occur. 3. In a terminal window, run 'uname -a' and note your current kernel version. Determine whether you're running a "3.8" or a "3.5" kernel. 7. In a terminal window, run 'dmesg | grep smart_connect' and note the output. If you see "Disabling Intel Smart Connect", then then the test fix has activated and the spontaneous wake problem should be fixed. However, if you see "AOS was already (something)" then the fix didn't activate because Smart Connect apparently wasn't enabled. (If you see neither of those messages, please report that). 8. Finally, test whether the spontaneous-wake problem is fixed or if it still occurs. (Extra note for Dell XPS13 users: Both of the test kernel versions also include the XPS13-backlight fix, so the test kernels are suitable as temporary replacements for the Sputnik PPA kernels). Thanks in advance for your help with this testing. I have also experienced Fábio Ramon's black screen freeze. Nothing but waiting for the batteri to drain had any effect, the power button being completely disabled. It has happened three times, since March, and I can't really pinpoint what causes it. I can say it have happened both with Smart Connect on, and off. 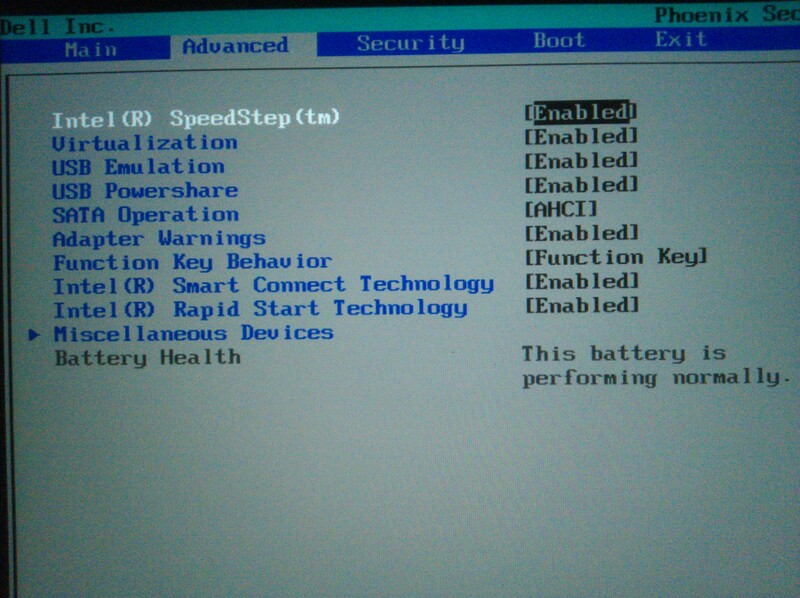 Everything else is default in the BIOS (no legacy enabled). The computer was delivered with W8. Seemingly the issue happens only when closing and reopening the lid, with "bad" timing, leaving the computer in a zombie state. @Kamal Thanks for supplying a kernel for us to test! However, I won't be able to test it until September (if relevant then). I hope someone else watching this thread will be able to test it for you before then! I found today that my XPS 14 wakeup woes were all in /proc/acpi/wakeup. Disabled LID0,EHC1, EHC2, XHC - now we sleep like a baby. I guess at one point I will feel motivated to find out which USB controller exactly is the culprit. In the meanwhile, I re-enabled LID0, cause I kinda like the wakeup with the lid open. There is no activity last 3 months. Is there any solution or workaround for this problem? I have exactly the same problem with Lenovo Ideapad S400. I believe this problem is about a bug with Intel chipset driver. I disabled all enabled acpi settings in /proc/acpi/wakeup but it does not solve the problem. I tested with Ubuntu 13.10 and Ubuntu 13.04. And I have same problem with both of them. Still seeing this on 13.10 with latest updates. I have rapid start enabled, and according to this, it WAKES UP and then sleeps (but not Ubuntu? ), this must be the problem? Any progress on this? I have the same problem on my Asus running 14.04 Beta. It seems to be fixed after the latest updates. I don't have this problem anymore. I was having this issue in a Inspiron 14z 5480 , Intel Rapid Start enabled. I had a script turn off all usb wakeup events before suspending and logging the result of rtcwake -- with all disabled, the laptop would still wake up. After I saw laptopmode-utils doing all sort of stuff before suspention, I uninstalled it. Haven't had one unexpected wake up for 5 days. This happened to me a couple of times, maybe more. I doubt Intel Rapid Start is the problem. Also, I configured it to hibernate my laptop after 15 minutes and my laptop still managed to wake up from suspend within that amount of time. I could investigate that much as it happens randomly and always in the wrong moment, but I've managed to grab the dmesg the last two times it happened. Unfortunately, I couldn't find anything interesting in there. It shouldn't be complicated to realize a workaround (if wake up while lid is closed => put to sleep again), but I still would like a proper fix and an explanation of this problem. Here the second dmesg I grabbed. Since the wakeups are random and doing tests is complicated, I'd like to ask to all of you with this problem to try the following. Check with the first command if all the devices are *disabled (except for LID0 of course). Note: these changes are not permament. What I suggested in my previous message didn't solve the problem and as said by other the problem was Intel Rapid Start Technology. What happens is that the firmware sets a wakeup timer as soon as the laptop is suspended and doesn't cancel it if the laptop is resumed before it expires. Linux is not aware of this timer and so it doesn't cancel it as the firmware expects it to do. IRST does not require any configuration, so the timer is set as long as IRST is activated (I don't know if not having the dedicated partition prevents the problem even if IRST is activated). I'll link the fix once is available in the mainline kernel, in the meantime disable IRST from the BIOS or set wakeup_events  to either 0 or 2. Interesting bug. I upgraded my Ubuntu 14.04 kernel (currently 3.13.0-53-generic) to mainline 4.0.5 and saw the exact same issue. Fiddling with /proc/acpi/wakeup and kernel 4.1 seems to fix the spontaneous wakeups on my macbook. However after a day, acpid seems to "see" events like LID_CLOSE. Newer Ubuntu version will use systemd for suspending so I am not sure what benefits I get from debugging this. Same problem with XPS 13 2016 (i5 processor, 8gb ram, 128gb hard drive). I am dual booting with W10 using efi. Cinnamon desktop environment. This is still an issue with 4.8.0-32-generic, on the 2016 Dell XPS 13.